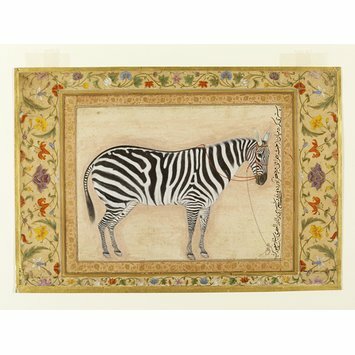 The zebra in this painting (Burchell's Zebra, Equus quagga burchelli) was presented to the Mughal emperor Jahangir (r. 1605-1627) by Mir Ja'far who had acquired it from Turks travelling to the Mughal empire from Ethopia. Jahangir wrote on the painting (in Persian, the court language) that it was: 'A mule which the Turks [rumiyan] in the company of Mir Ja'far had brought from Ethiopia [Habasha]. Its likeness was drawn by Nadir'ul-'asri [Wonder of the Age] Master Mansur. Year 1030 [ie 1620-21], [regnal] year 16'. Jahangir's memoirs, the Jahangirnama (Book of Jahangir) make it clear that the animal was presented to him during the extensive Nowruz, or New Year, festivities in March 1621. When Jahangir had carefully examined it, and ensured that it was not, as some thought, a horse on which someone had painted stripes, he decided to send it to Shah Abbas of Iran, with whom he often exchanged rare or exotic presents. He does not mention ordering the animal to be depicted in a painting, and the inscription is the only evidence for Mansur's encounter with this exotic beast. The painting was almost certainly intended to be an illustration for his memoirs. No illustrated volume has survived, and it is likely that none was ever completed. The painting later came into the possession of Jahangir's son, the emperor Shah Jahan (r. 1628-58) and was added to a royal album of paintings and calligraphies. The ornate borders of the painting, and on the reverse of the folio, framing illuminated calligraphy (IM.23A-1925) are additions of Shah Jahan's reign. The folio belongs to a group known as the Minto Album, now divided between the V&A and the Chester Beatty Library, Dublin. The zebra is depicted facing right against an undyed paper on which earlier outlines have been covered with a light pinkish wash. The animal is tethered to a post and has a red harness. On the right, a Persian inscription in black ink identifies the subject, artist and provides the date. The borders are filled with polychrome flowers and green leaves on scrolling lines and are later additions of the reign of Shah Jahan. 'A mule [astari] the Turks [rumiyan] in the company of Mir Ja'far brought from Ethiopia [Habasha]. Its likeness was drawn by Nadiru'l-'asri [Wonder of the Age] Master Mansur. Year 1030, [regnal] year 16. The Persian inscription is in Jahangir's hand and runs along the right side of the painting. Steingass (Persian-English dictionary) glosses astur as 'mule (S.asvatara)'. 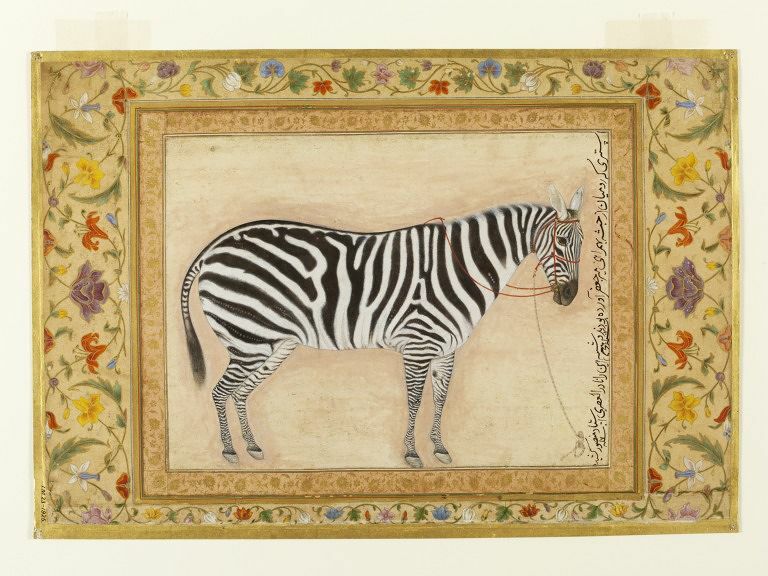 The painting of the zebra was done for the Mughal emperor Jahangir by one of the leading artists of his reign. It was undoubtedly intended to illustrate a royal copy of the emperor's memoirs, the Jahangirnama or 'Book of Jahangir'. No illustrated copy of the volume has survived, and it would seem that none was ever completed. The painting was certainly inherited by Jahangir's son, the emperor Shah Jahan, who had the floral borders added so that the painting could be included in a new volume of illuminated calligraphic specimens and paintings. This painting has illuminated calligraphy on the other side of the folio (IM.23A-1925). The page belonged to a group of loose Mughal folios sold at auction in London in 1925 as "The Minto Album" and subsequently divided between the Chester Beatty Library, Dublin and the V&A. ASok Kumar DAs was the first to provide the scientific classification of the animal, based on the information provided by Divyabhanusinh: it is Burchell's Zebra, Equus quagga burchelli (Das, Wonders of Nature, p. 86). Susan Stronge, Painting for the Mughal Emperor: The Art of the Book 1560-1650, V&A Publications, 2002, pl. 100, p. 135. The Jahangirnama. Memoirs of Jahangir, Emperor of India. Translated, edited and annotated by Wheeler M. Thackston. Freer Gallery of Art. Arthur M. Sackler Gallery, Smithsonian Institution, Washington DC in association with Oxford University Press, New York/Oxford, 1999, pp. 360-1 and p. 477. Barnard, Nick: Arts of Asia, vol. 45, no. 5, September - October 2015, "The Parasol Foundation Trust Programme: digitising and cataloguing the V&A's South Asian collection. ", p.104, pl. 16.